Tradition at S's school allows for only the Kindergarten class to dress up in their Halloween costumes and parade around the school, visiting each of the older classrooms and then through the cafeteria where the parents and siblings await. After the parade her class posed for a group picture before having a special day of Halloween events. This year S chose an Alice in Wonderland costume. I don't think S has ever heard of Alice, but it was her favorite costume at Target, so that is what she is! As has been the past few years, S is blessed with several birthday celebrations during October. Today, her actual birthday, she got to take cupcakes into school to share with her class. She received from them a birthday book where everyone drew a picture of Sydney and wrote why she was special. In the evening she got to open her presents and at dinner she had her favorite meal: lemon-garlic shrimp with couscous and broccoli. This was followed by sharing birthday cake with our friends and neighbors. It was a fun birthday month for Sydney and I hope she knows how special she is and how blessed we are to have her in our lives. 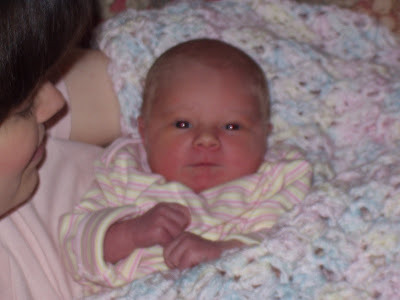 I'll close with one of her first pictures so we can be reminded of how much she's grown up these past 6 years! We love you, Sydney! The dining room before the party started. Each guest had a party hat, a Hello Kitty party blower, and a jewelry box to decorate with sparkly stickers. The girls also played pin the horn on the unicorn and dressed up as princesses. We didn't even have time to do our Bingo game or face painting! S and J have a new cousin! Caleb was born very early this morning. We all went to see him at the hospital to wish him a Happy Birthday! J was especially enamored with the baby and enjoyed touching his dark, soft hair! Welcome to the family, Caleb! S poses next to Henry David Thoreau statue outside his replica cabin. J thinks Thoreau's broom is just his size and helps sweep out the cabin. When October rolls around we are definitely focused on celebrating Sydney, since it is her birth month. Today we had a cousins' party for the family since Cousin L's birthday is the day before S's. We had to have the party early in the month because Uncle Ben and Aunt Ruthie are expecting a new baby any time now and we wanted to make sure we had a good opportunity to celebrate S and L, who is turning 2. Sydney helped pick out the decorations at the party store and we opted for a Hello Kitty theme complete with birthday crowns for the girls, balloons, and pink tableware. S and L had a great time eating mac and cheese, opening presents and eating yummy chocolate pumpkin cupcakes that Aunt Ruthie made. 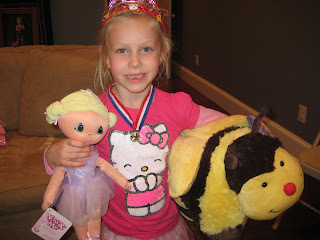 S was thrilled with her presents and can't wait for the next party!